That quote from the 1968 Chevrolet Corvette brochure said it very well. 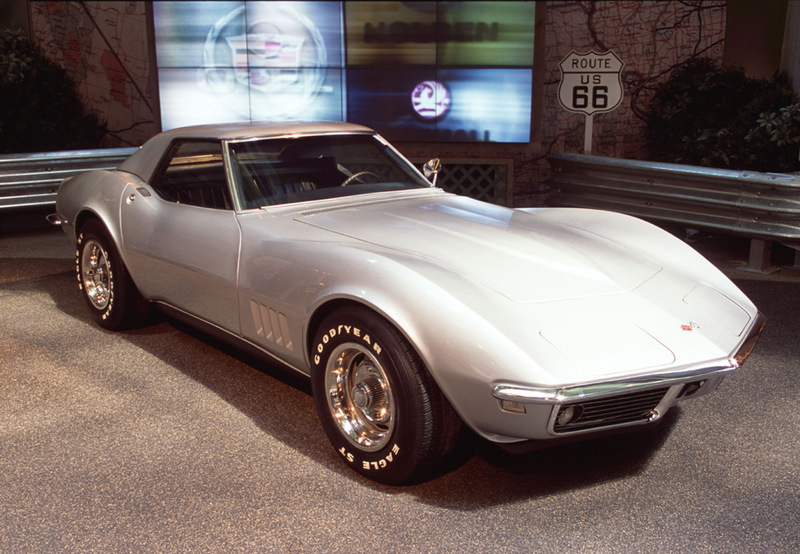 Five years earlier the 1963 Chevrolet Corvette would establish the Corvette name as a design tour de force. The 1968 would reinforce that reputation with an all new body style. The new design would become a classic. Corvettes for the next forty years - including the C4, C5, C6 and C7 generations - would follow the same basic lines and be recognizable as a relative of the 1968 trend setter. The new Corvette featured what would become known as the "Coke Bottle" shape. It's in reference to the fenders which bulged out in comparison to the doors. 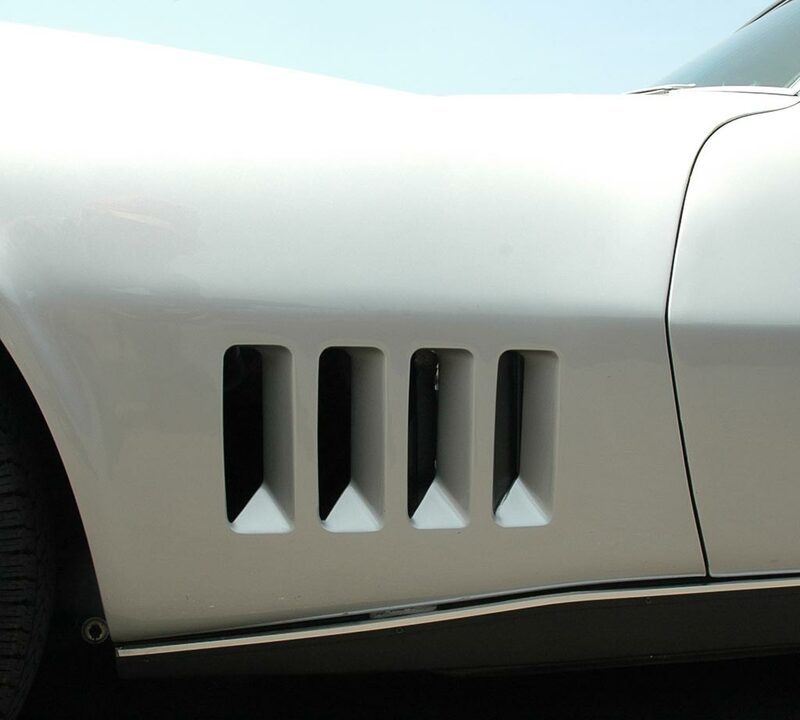 Also note the emphasis on the fenders as they arched upward - a continuation of the C2 Corvette. 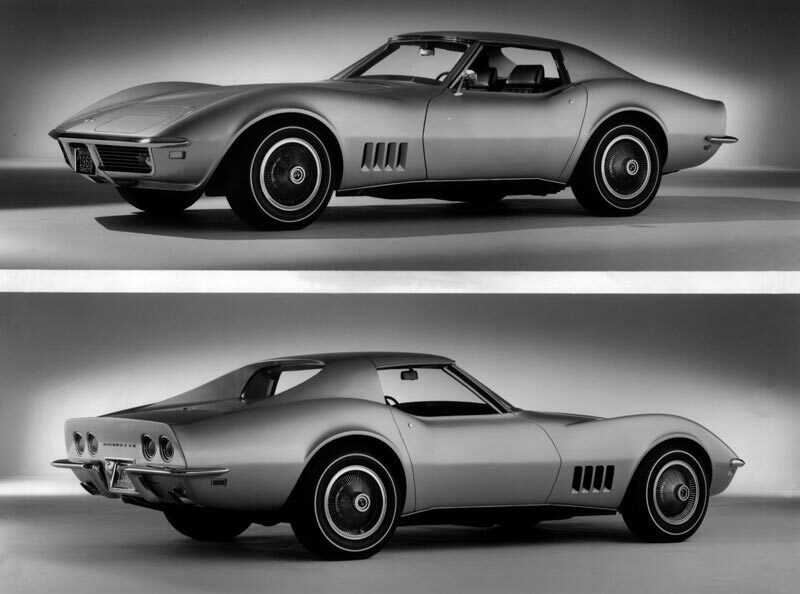 The shape of the new C3 also featured improved aerodynamics when compared to the C2 Corvette. High speed front end lift was a problem that many racers complained about. 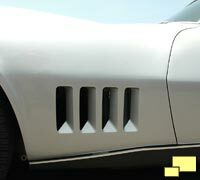 Corvette chief engineer Zora Arkus-Duntov said in interviews that the C2 'vette "had the aerodynamics of a bad airplane". 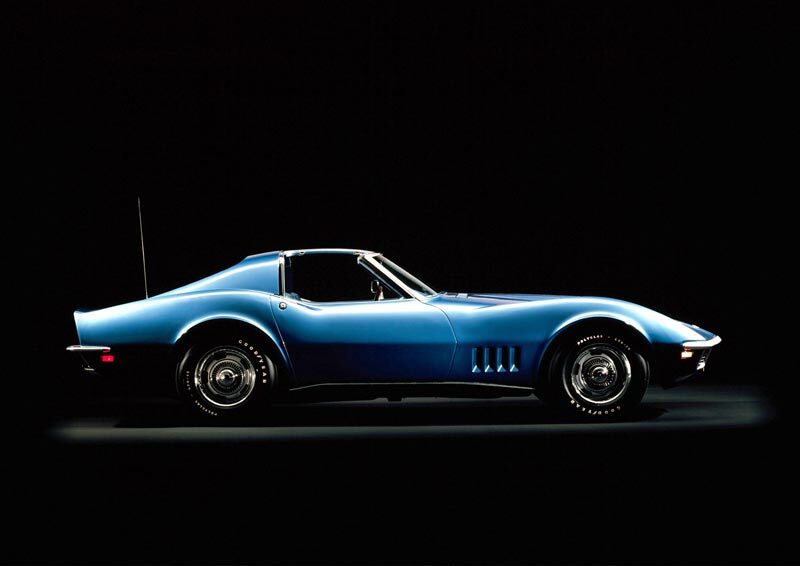 For unknown reasons, the 1968 Corvette is not a Stingray. There is sometimes confusion on this point as the body style is basically the same as the 1969 thru 1976 years. 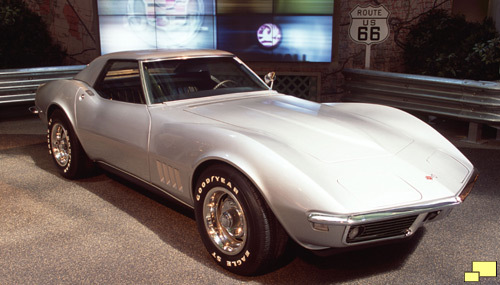 Unlike those years, the '68 did not feature the "Stingray" script above the side fender vents. There was one occasion when "Sting Ray" did slip by - in this print advertisement. 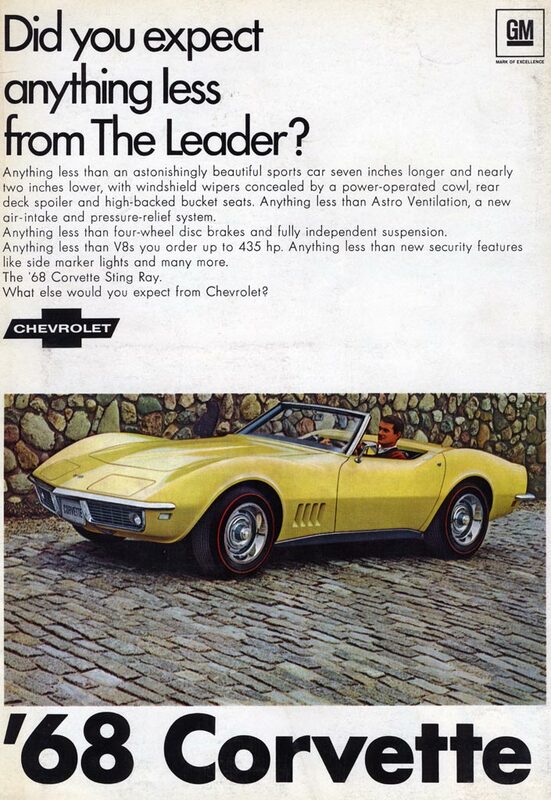 Notice the "The '68 Corvette Sting Ray" text, which had "Sting Ray" as two words, not the single "Stingray" used in 1969 thru 1976 Corvettes. The single "Stingray" moniker would appear again in the C7 Corvette. 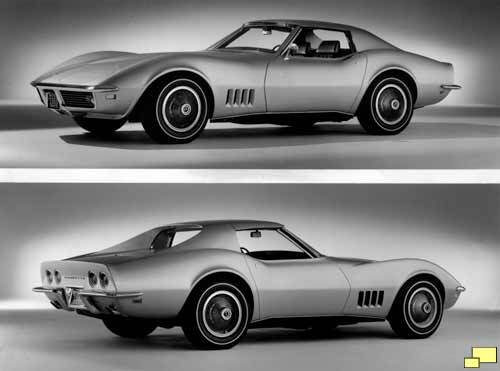 Notes: Base Corvette Coupe with 327 cu. in. 300 hp engine and three speed manual transmission: $4,663.00. Base Corvette Convertible with 327 cu. in. 300 hp engine and three speed manual transmission: $4,320.00. curious on how you got the picture of my car on your sight?